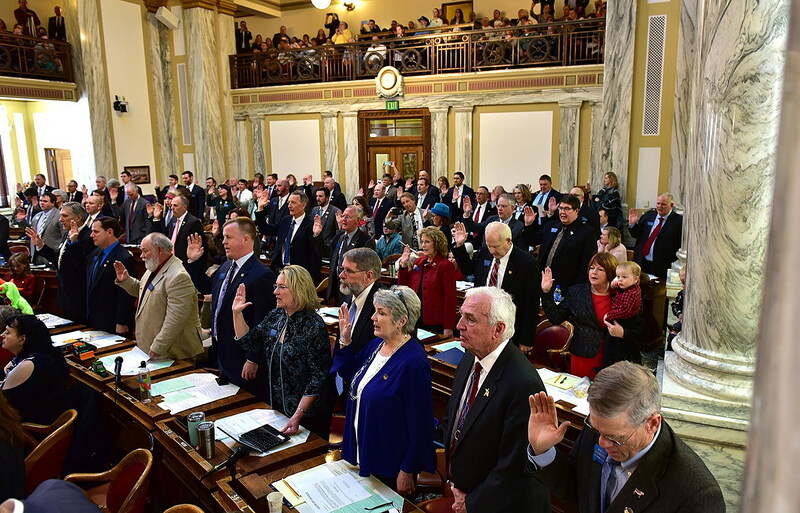 (Montana Free Press) Hours before Montana lawmakers gaveled-in for the 2019 legislative session, Republicans appeared to have struck a deal on House rules. According to a draft of temporary House operating rules presented when representatives met on the floor at 1 p.m. Monday, lawmakers now require a simple majority vote to approve the Speaker’s committee appointments. The temporary rules also tweak the number of votes needed to push bills out of committee and onto the House floor for debate. The motion passed along party lines, with Republicans supporting the motion and Democrats voting against it. The temporary rules expire at noon Friday, meaning lawmakers will still have to strike a compromise to operate for the rest of the session. But the temporary motion marks a significant concession to the self-described Republican “Solutions Caucus,” which has been working to overhaul House rules ahead of the 66th session. “On day one, Republicans are united and ready to get to work,” said House Speaker Greg Hertz, R-Polson, in a press conference following the vote. The motion notes the temporary operating rules will remain in effect until Friday, Jan. 11. “Then they’ll hammer away in the Rules Committee and see if they can’t get [out] any of the kinks they disagree with on this one,” said Rep. Llew Jones, R-Conrad. The Rules Committee is scheduled to meet at 9 a.m. Tuesday. A series of amendments to House Rules first emerged in December, which devolved into a fight after the House Rules Committee adjourned without debating the changes. One of the major shake-ups would have prevented legislation from stalling in “kill committees” by allowing a simple majority — 51 votes — to “blast” bills out of committee and on to the House floor for a vote. Currently, such blast motions require a 60-vote supermajority. Democrats were not part of Monday’s deal, according to House Minority Leader Casey Schreiner, D-Great Falls. Schreiner also noted he does not support the temporary motion. “I went to the speaker this morning and did say, in full transparency, ‘We’re not on board with whatever their solution is,’” he said. Since Democrats weren’t at the table to negotiate the deal, Schreiner urged his caucus to vote “no” on the motion in today’s floor hearing. The Solutions Caucus and House Democrats also pushed a change to the speaker’s authority — specifically, the way he can stack committees with members that will likely table bills he doesn’t like. Members have called these “kill committees” designed to keep bills from reaching the House floor. Monday’s vote resolves that issue for now. Requiring a majority vote to approve committee appointments scales down the power of the speaker. In addition, the temporary rules require committee chairs to schedule hearings for all assigned bills. The temporary operating rules also address blast motions. Instead of requiring a simple majority vote, which Democrats support, moving legislation out of committee now requires the same number of votes as members in the majority caucus. For 2019, that means blast motions need 58 votes since the Republicans hold 58 seats in the body. Monday’s temporary motion passed with “yes” 58 votes. Membership of the so-called GOP Solutions Caucus remains unclear, but fissures in the Republican party emerged as early as 2007. Rep. Nancy Ballance, R-Hamilton, Rep. Ed Buttrey, R-Great Falls, and Jones have been among the most vocal supporters of House rules changes. House Majority Leader Brad Tschida, R-Missoula, has criticized the changes, saying they weaken the GOP’s power at the statehouse. MTFP editor John S. Adams contributed to this report.